Running a photo booth shouldn't be complicated or expensive. Run dslrBooth photo booth software on your pc or mac, hook up your Canon, Nikon, Sony dslr, or Webcam and you have a professional photo booth. Software works as expected. Green screen option in the program is fantastic! Really easy to build your own templates. Built 30 my own movie templates for an Oscar party. The professional edition is definitely worth your purchase. Had the photo booth set up for new years and it was most certainly the highlight of most people's evening. There wasn't one time that i saw that the booth was empty. Mostly how professional the software felt to use. People couldn't believe that it was a DIY job. They loved it. I highly recommend this software to drive your photo booth! I have been doing instant print or photo booth all these years. I did it in our convention way, shoots and download images and process by photoshop for the layout and text. After using dslrbooth, now I only mounted a camera onto a triport and link it to tv monitor and laptop and set up the printer that's it. All customer like it as this is like they are doing their own "wefie". No photographer needed hence save cost and time. I don’t run a photo booth business I just set this up for my sister’s wedding with a friends DSLR and a NUC. It ran very smooth no issues at all. It was the biggest hit at the wedding and we have about 200 prints to remember the wedding and all our friends. So glad I went with this software. I compared and tried all that I could find this is by far the best. I was asked to do 2 photobooth-type jobs & all the questions about "printing on the fly", "emailing", "social media" came up. 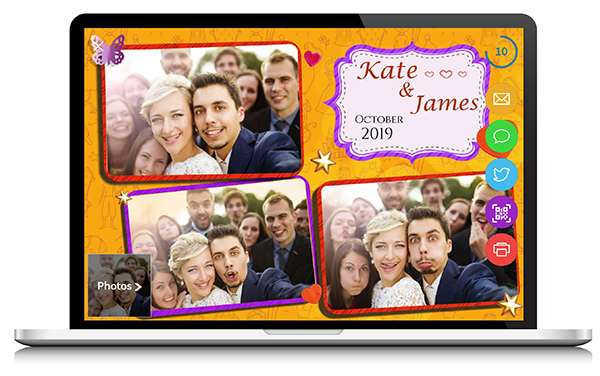 After looking for an inexpensive software that could do at least one of those requests, I found dslrBooth... not only did it do the printing/branding of the prints - but I was able to impress the client by the social media sharing! Thank you, thank you, thank you! Get guidance with our comprehensive support site, video tutorials or contact our highly experienced support team. Our instagram + twitter hashtag printing software. See and print photos for your event's hashtag in seconds. Looking for an affordable, portable, and high quality photo booth?